This post was inspired by the heart-wrenching video on the New York Times page about rural residents’ reliance on coal for income I mentioned in the previous post. Scrawny men in coal-dusted clothes and coal-stained hands speak about how their lives have improved due to the income they receive from coal. The video reminded me of my thesis interviews last year when grandparents expressed concerns over the closure and relocation of factories near Beijing for the improvement of air quality in the city. They all agreed it would improve the air quality but worried that many people would lose their jobs as a result. They felt the situation was lose-lose: reduce poverty and have pollution, or cut emissions and eliminate jobs. The title of the video is “China Coexists with Coal,” conveying the importance of coal to the nation’s economy and its inevitable impacts on the environment. I think another title, “China’s Coexistence with Coal and Consumption,” would capture the story even better. The workers of factories and coal mines are often hidden in society, moreover, their whole occupational purpose is overlooked and forgotten. Why do we need so much coal and so many factories? For our consumption, of course. We often forget the connection between the two sides: coal miners and factories exist for consumers. This idea of the “other,” those most closely linked with the environmental degradation in Chinese society, was intriguing to me. Many of my Beijing upper middle class interviewees saw themselves as separated from the sources of pollution and degradation. “That’s a rural problem,” one even said. When I’d ask what they thought caused the problems, it was usually “factories” or “migrants.” (A small handful also noted “loss of societal values” and “consumer culture” as indirect causes.) A lot of interviewees insisted that the migrants created many of the problems in Beijing: traffic congestion, dust, litter, poor air quality etc. Corrupt local officials with protectionist policies towards polluting firms also came up as sources of environmental problems. But many Beijingers felt these migrants, these outsiders, not necessarily their own actions, caused the degradation in the city. Since the science behind climate change is so complex, it’s difficult for scientists to communicate to laypeople like us how our everyday actions impact the environment. Our generation is increasingly far removed from the environment, so it’s hard for us to connect the dots. Perhaps, most significantly, we hate to think that our own pleasures and luxuries are causing these problems. We can’t handle that guilt! So we blame other people instead. And often these other people have nonexistent carbon footprints. The easiest person to blame is the one without a voice. While China will continue striving to improve the livelihoods of the poor and curb its emissions, social inequalities may continue to play a role in how citizens view environmental problems. The rich may continue to buy multiple cars and then fill their houses with multiple air filters. What will others in society do? In the meantime, the blame game continues on a global, national, and local scale. 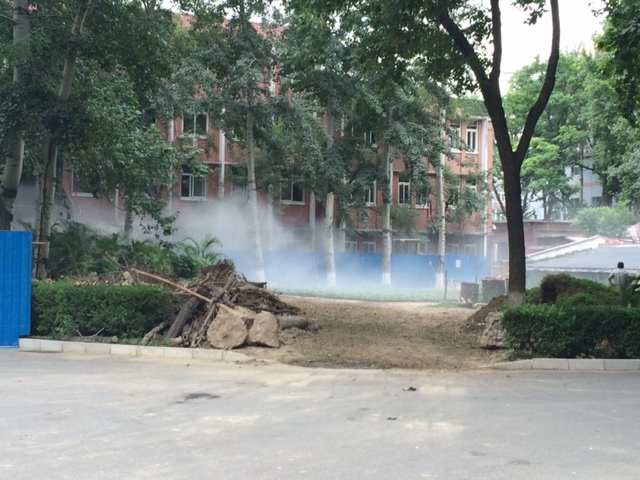 This is an example of a construction site at a university in Beijing, where migrants might work, and where there is also dust pollution.